On completion of her studies, Mrs. Persad-Bissessar entered the teaching profession. Her career history can be described as people-centered and one that has always focused her energy within the public’s eye. While in England pursuing studies, she worked as a social worker with the Church of England Children’s Society of London. She taught at the St. Andrew High School in Kingston, Jamaica and at the Mona Campus in Jamaica. Later, she taught at the St. Augustine campus of the University of the West Indies in Trinidad. At the Jamaica College of Insurance she was also a Consultant Lecturer. Her next step was to lecture at a Tertiary Education institution. After lecturing for a total of six years, Mrs. Persad-Bissessar then became a full-time Attorney-at-Law. 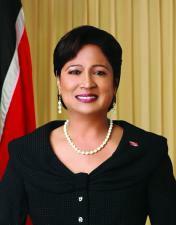 On Tuesday May 26, 2010, two days after a victory at the polls, Mrs. Persad-Bissessar created history yet again, becoming the first woman to hold the office of Prime Minister of the Republic of Trinidad and Tobago.